When it comes to trade show logistics, there is nothing more important than ensuring that your booth and all the items you need for the show arrive on time. A late shipment can mean lost business and can negatively effect your reputation. To prevent this from happening, it is important to work with a shipping logistics company that knows the ins and outs of trade shows and can work with you to guarantee that your show can go on as planned. On this front, AFP Global Logistics has you covered! Learn more about why you can trust us with your trade show and event shipping logistics in today’s blog. Trade show shipping is a hassle. Let AFP help. Most trade shows offer advance warehousing for your goods, usually up to 30 days prior to the show. If you are sending more than a small amount of product, this is the most cost-effective way to go. Consolidating all of your goods into one shipment will save on both shipping charges as well as the handling fees that general contractors apply. 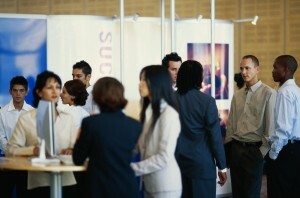 These can add up quickly so minimizing shipping and handling will maximize your profit at the end of the trade show. At AFP Global Logistics, we do more than half of our business in trade shows so you can be sure that we have the experience needed to handle your logistics with ease. A lot can go wrong during event shipping, including acts of god and mechanical problems, so you want to work with a company that has the experience to work through problems that could otherwise ruin your trade show experience. At AFP, we work with exhibitors, general service contractors, exhibit manufacturers, associations, and organizations to handle all of their trade show and event logistics and provide the peace of mind that only experience can provide. This entry was posted on Thursday, November 19th, 2015	at 2:00 pm	and is filed under Trade Shows	. You can follow any responses to this entry through the RSS 2.0	feed. Both comments and pings are currently closed.